The Gascoignes :: Part Seven, Party Time! 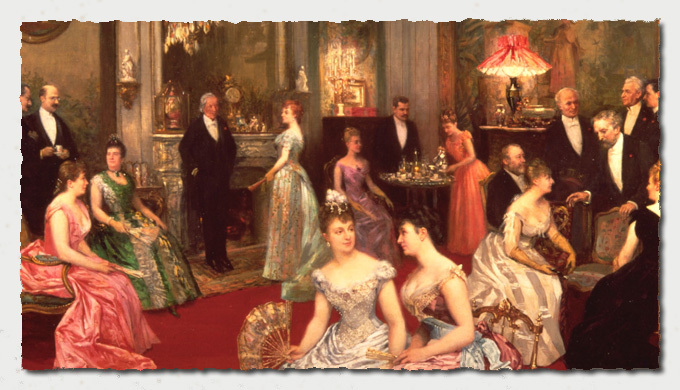 The header picture is just an idea of what a party may have been like in the 19th century. A fellow researcher, Pauline Robson, recently sifted through the West Yorkshire Archives of the Gascoigne Papers and amongst the Housekeeper accounts she extracted the details of the food consumed and numbers of persons dining, for both Christmas 1850 and 1858. She has kindly allowed me to publish her findings here. The two periods examined are different if only because in 1850 the Christmas period followed closely the wedding of Isabella and Frederick in the September. The first item of beef represents 43.60lbs per day, which is more than a pound per day, regardless of station, of each member of the household. However the number of guests relative to the members of the household is significant being 3 to 1 or on average 10+ guests each day of the period analysed. These days people are glad to see their relatives disappear down the drive at the end of the day! Another revalation is the shear variety of produce, Woodcock... when was the last time you had that! As for the Plover, these days you might fall foul of the RSPB, pun intended. Does this section provide sufficient detail?